An illustration in Richard's Illustrated shows the districts of Chicago affected by the Great Fire. 1871. 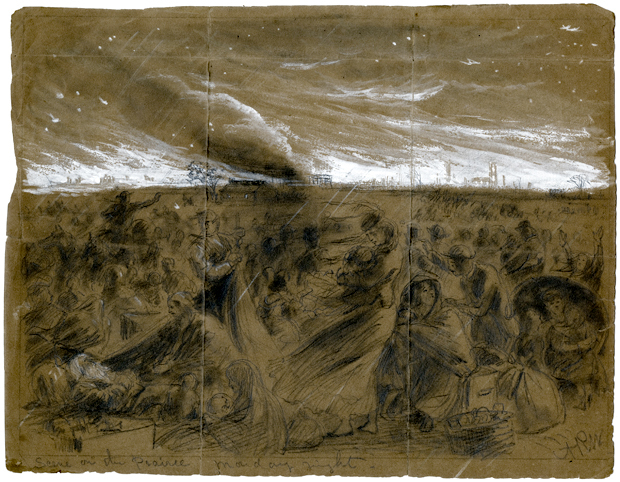 Illustration from Harper's Weekly featuring refugees in Lincoln Park during the Chicago Fire of 1871. The Great Chicago Fire has been a key part of Chicago’s identity since the fateful dry, windy night of October 8, 1871, when the O’Leary barn caught on fire. The blaze is represented by one of the stars on the city’s flag. It’s cited as the reason Chicago became a beacon of innovative architecture. And, it’s often referenced with pride as an example of Chicago’s indomitable, can-do spirit. 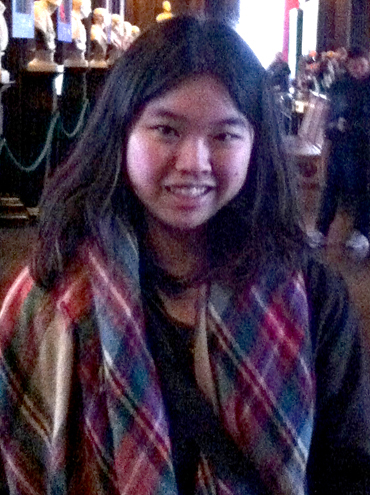 But University of Chicago history major Angela Lee asked us to skip all that. Instead, she asked us this question, which gets to a less-commonly discussed aspect of the disaster — how it affected residents’ relationships with each other. 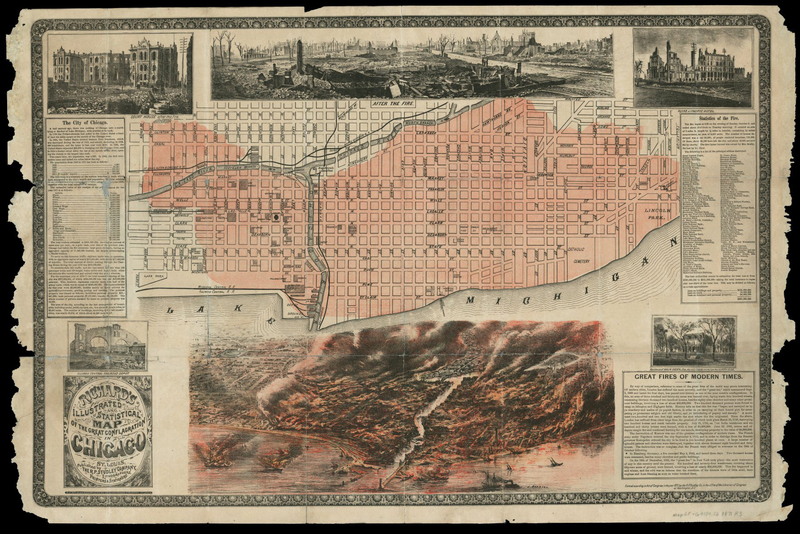 How did the Great Chicago Fire of 1871 affect where Chicago’s wealthy and poor lived? Significant gaps in the historical record create problems answering this question with much precision, but there is a lot to learn. Among other things: Chicagoans at the time were uneasy when it came to the mixing of the social classes. And months after the fire, social tensions were stoked by — of all things — the type of materials available to rebuild. In 1870 Chicago was home to 298,977 people. Lacking modern zoning and planning sensibilities, the city was also a hodgepodge; homes, businesses, and even small manufacturing establishments were located near each other. According to Anne Durkin Keating, professor of history at North Central College, Chicago’s working class and poorer areas tended to be near the river, on undesirable polluted land and close to jobs. The neighborhood where the fire began on the South Side, for example, was packed with small, wooden homes of immigrants according to Karen Sawislak, the author of Smoldering City: Chicagoans and the Great Fire, 1871-1874. The wealthy were also spread out, often near the emerging central business district, Keating says. One wealthy enclave was north of the river, centered around Washington Square Park on the Near North side. Large homes in that area were owned by families with familiar names like McCormick, Ogden, and Kinzie. 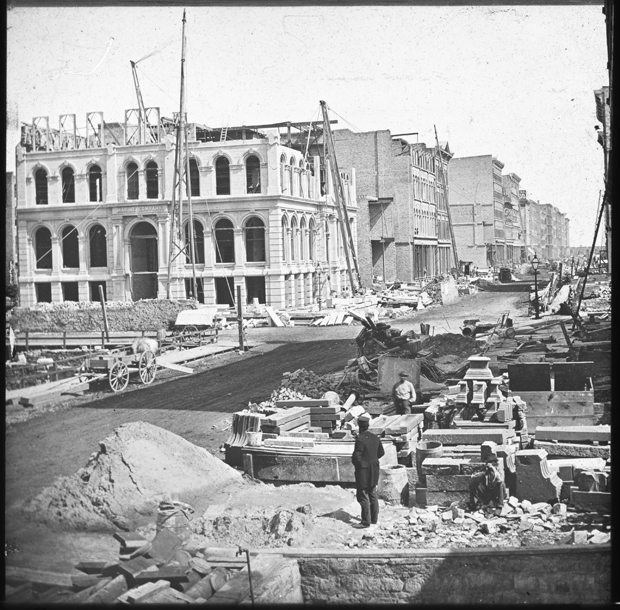 Another wealthy enclave that was not affected by the fire was Prairie Avenue between 18th and 20th Streets. In contrast, renting was common among wealthy people with deeper roots in the country. “Native-born Americans weren’t so interested in owning homes. There was more prestige in some renting areas,” Lewinnek says. During chaos of the fire, people from all walks of life fled their homes with a few treasured possessions and valuables. They waited for the fire to pass wherever they could: in the lake, on the prairie, in parks and in tunnels. People even sought shelter in abandoned graves. Bodies had been removed from City Cemetery years earlier, but the actual graves had not yet been filled in. These empty graves made a convenient, if creepy, place to seek shelter. The usual divisions between groups of people vanished as Chicagoans endured this epic fire together. In fact, this jumble of different types of people was an element of why the fire was so distressing to some. “This is the Victorian age. It was a time when people wanted their spatial separations to be clear. It wasn’t clear right after the fire, part of the pressure in rebuilding is to make things clearer,” Lewinnek says. Nevertheless, a feeling of unease remained. “Very quickly business leaders in the city basically prevailed upon the mayor to cede civic authority over peacekeeping in the aftermath of the fire, and give it to the army. It became a military operation commanded by General Philip Sheridan,” Sawislak says. In 1872 Elijah Haines, a member of the Illinois House of Representatives, spoke to that body about the brief military presence in Chicago. “They are men with bayonets, bringing complete military armament. For what purpose? For war?” he said. He also describes an incident that may have hastened the end of this period of military involvement. “Theodore Treat, a twenty-year-old college student on volunteer curfew duty, shot Thomas W. Grosvenor, who died the next morning. Grosvenor was a former Civil War officer and successful lawyer” Smith writes. He continues, “Grosvenor may in fact have been a victim of the false reports of rampant criminality that put Treat fatally on edge.” Three days later, on October 23rd, 1871, General Sheridan resigned from his temporary post overseeing Chicago’s security. As Chicago emerged from this tense environment, the city discussed how to rebuild the burnt district. Foremost on some people’s minds: preventing a similar disaster to the one they had just endured. This school of thought proposed new building rules, the most strident being that, for safety’s sake, only brick and stone would be allowed for construction within the city limits. The problem with this idea? Wood was cheap. For the immigrant homeowners on the North Side, maintaining their homes trumped even fire safety. “People were furious,” Lewinnek says, “especially the German and Irish immigrants who lived on the North Side who had been most burned out by the fire, were furious they might not be able to rebuild.” They tended not to have reliable insurance and felt they wouldn’t be able to afford to keep their land if wood construction was not allowed. “They’d say things like: ‘We don’t care if the city burns again, we need our own houses,’” Lewinnek says. Populations affected included those of German, Irish and Scandinavian background. In the end, the North Side immigrants won the right to re-build with wood on their existing property. Areas north of Chicago Avenue and west of Wells Street and Lincoln Avenue were outside the new fire limits. 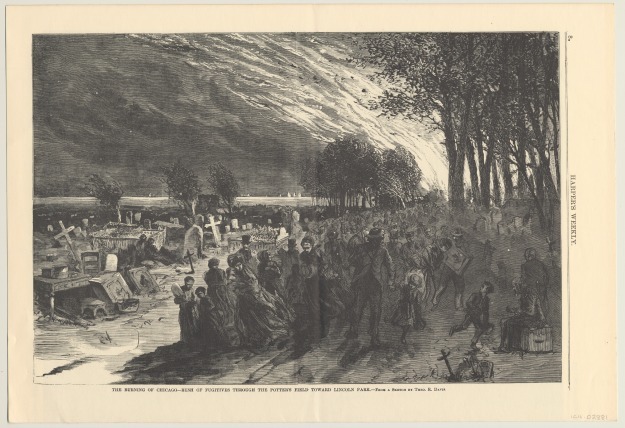 After another significant fire in 1874, the fire limits were finally extended to the city, according to Elaine Lewinnek. By that time, most of the North Side immigrants had managed to rebuild their homes, and so their wooden homes were “grandfathered in” according to Lewinnek. In terms of how the fire changed the layout of Chicago, existing trends quickened. In general, property owners and even wealthy renters tended to remain where they were before the fire. Suburbs continued to grow. Distinct districts — residential, manufacturing, and the downtown area — developed. Downtown land prices rose. This imbalance, Sawislak argues, extends even to the estimated three hundred people who died in the fire. “Even the fact that it’s always an estimate tells you something,” she says. “Most victims — virtually all — were working class, immigrants, in very densely packed immigrant neighborhoods that were most impacted by the early stages of the fire on the South Side.” Even following years of research, Sawislak says she’s never discovered a comprehensive list of names of the deceased. Combine this, she says, with the fact that the working poor left behind so few written accounts of the fire, and you’re struck with an uncomfortable truth. “The silences are really kind of what’s telling.” she says. Special help for this story comes from Carl Smith, author of Urban Disorder and the Shape of Belief: The Great Chicago Fire, the Haymarket Bomb, and the Model Town of Pullman. He also curates The Great Chicago Fire and the Web of Memory. Katie Klocksin is an independent producer. Follow her on twitter @KatieKlocksin.